Motion activated real time video is recorded on a tiny SD card, housed in a hidden compartment. 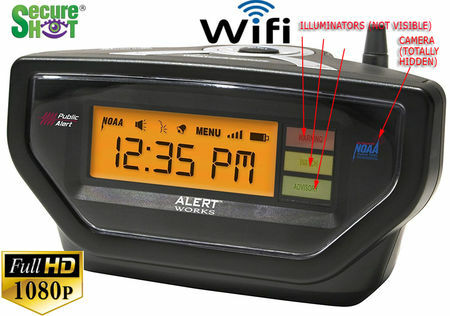 This Alert Works weather alert clock radio functions normally. All recording are time/date stamped for professional security applications. Records color video by day, and B&W video at night EVEN IN TOTAL DARKNESS, thanks to our hidden array of totally invisible "no glow" IR Illuminators. Very covert! No "Tell Tale" SD Cards glaring out the back or suspicious looking out of place jacks. Out Total Covert line looks exactly as it does when it comes out of the factory box! – Totally hidden SD card. Motion activated real time Full High Definition (1080P) video. One year warranty and free lifetime tech support. The next generation of covert security cameras has arrived. Introducing the SecureShot HD Live View Weather Alert Alarm Clock Radio Spy Camera/DVR w/Nightvision self contained, high definition, self recording system with Wi-Fi. No need for outdated receivers or extra connections to your PC or router. Live encrypted 1080P high definition video is transmitted to your wireless router enabling live streaming on demand from any authorized PC, Iphone, Ipad or android device. (free app download) Plug and Play P2P automatic connection to your wireless router is simple and quick, no PC expert required!